A set of 18 microsatellites was developed for the freshwater fish southern pygmy perch (SPP) Nannoperca australis (Percichthyidae). SPP is an endangered species endemic to South-eastern Australia. Applying a next generation DNA sequencing approach, we obtained 12,725 sequences containing putative microsatellite motifs using 1/8 of a shot-gun pyrosequencing reaction. Twenty-three microsatellite motifs with enough flanking sequence were selected for primer design. All 18 microsatellite loci were successfully genotyped using three multiplex reactions in 38 specimens of SPP rescued from the wild and kept in captivity. The number of alleles per locus varied from 3 to 15 alleles per locus (mean = 7.6) and the observed heterozygosity ranged from 0.368 to 0.921 (mean = 0.648). Evidence for null alleles was observed only for one locus (Nau33). No deviation from Hardy–Weinberg equilibrium or linkage disequilibrium between pairs of loci were detected. 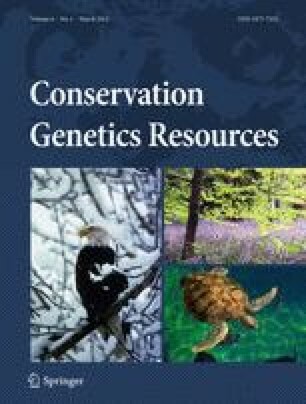 These polymorphic markers will prove useful for an ongoing conservation-breeding program of SPP aimed at minimizing kinship in captivity and for studies on landscape and restoration genetics. Funding for this study was provided by the Australian Research Council (LP100200409 to Beheregaray, Harris & Adams). Additional support was received by Department of Environment and Natural Resources, SA Museum, SA Murray-Darling Basin NRM Board, PIRSA Fisheries and Native Fish Australia (SA). We thank Mike Gardner for assistance with data analysis and Mariana Bertelli for laboratory assistance. DC is grateful to CAPES, an institution from the Brazilian Ministry of Education, for his postdoctoral fellowship (# 4095-09-0).